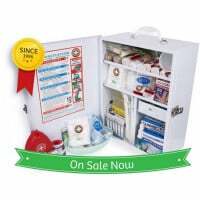 Our K450 Portable First Aid Kit ensures that you are covered for High risk level workplaces or if you just want a serious kit for around the family farm. Portable and hard wearing container. Easily accessible two tier open tray system. This kit is designed to cover tradies, fire fighters, remote area workers, mine sites and paramedics. - The National First Aid Code of Practice requirement is to have 1 First Aider per 10 people in Remote work environments. 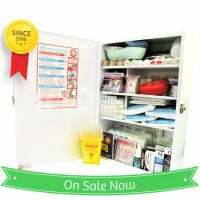 - Locate the First Aid Kit so you have immediate and unrestricted access when it is needed. - Any environment that has more than 100 people requires a First Aid Room. If you are considering the need for a First Aid room call us to discuss. - Always consider having a Defibrillator on hand. After conducting your risk assessment revisit the type of employees you have. If there is any pre-condition that would indicate the need for a defibrillator then you will have no choice but to ensure one is available for your staff.